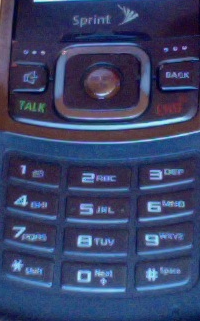 If you have a phone like this, you know that texting gets annoying — if you want to type “Hi”, you need to press the 4 button twice, wait for the cursor to move over a spot (or hit the right arrow button), and then hit 4 three more times. In other words, the sequence of button presses to type “hi” — what I’ll call the keypress sequence — is ‘44.444’, where ‘.’ is either a delay or the right arrow key. That’s 6 presses — 3 times the number of letters — to type one of the most common words in the English language. That’s not so good. Ruminations like this made me wonder what are the best and worst words to type on a keyboard like this. A bad word would require many more button presses than letters — either because lots of the letters the 3rd or 4th on their key (like S), or because several consecutive letters appear on the same key, requiring lots of right arrow presses (like the word “moon”, whose keypress sequence is “6.666.666.66”). Remember hangman? Here are the rules: Player A chooses a secret word (say “hollow”) and draws underscores for each letter in that word (“_ _ _ _ _ _”). Player B then guesses a letter. If that letter is in the word (“L”), player A reveals the locations of those letters (“_ _ L L _ _”). If that letter is not in the word (R), then player B gets a strike. If player B gets a certain number of strikes (perhaps 6 or 8 ) before he guesses the word, he loses. Otherwise he wins. If you are the guesser, what is your strategy for guessing? Or, more nerdily, how would you program a computer to guess at hangman?